The existing park is a 544 acre site acquired in 1981, with a prior history as a state prison farm, and is nestled between the north and south channels of the Boise river in the heart of the bustling Treasure Valley metropolitan area. Existing uses included a nine acre swimming pond, water slide, picnic shelters and perimeter equestrian and walking trails. The majority of the park was grass pastures with grazing cattle. Develop Eagle Island primarily as a natural park accessible to urban dwellers. Preserve, enhance and sustain the park’s natural and cultural resources. Through a series of design charrettes, the committee brainstormed what the park might look like, what it might offer and how it might function. The best ideas from those sessions were combined into a single vision, refined by technical experts, and reviewed a final time by the committee. First, their vision includes a new, grand entrance to the park off State Street. Visitors will cross the river on a new bridge specifically designed to provide safe passage on and off the island, even when existing bridges might be impassable during a major flood. 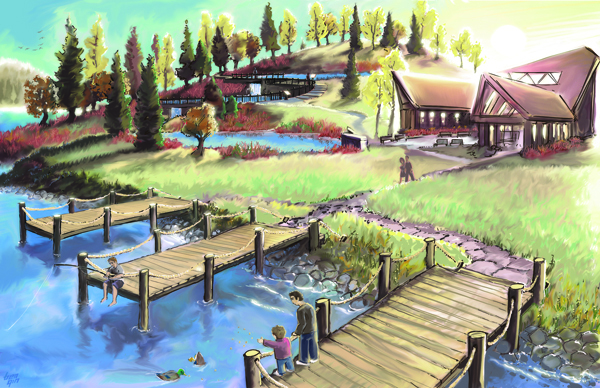 A new welcome center will orient visitors to the park, and introduce them to Idaho’s entire park system through interactive exhibits. There will be a small campground for RVs, but the focus is on camping for scout, school and church groups who want to set up tents, and for kayakers and canoeists. A greatly enhanced trail system will take you along the river bottoms, near protected wetlands, and beside a tempting series of water trails. A wetlands interpretive center operated with Fish & Game will educate the public about Idaho’s diverse environmental ecosystems. The wetlands center concept includes an amphitheater to accommodate school groups that will double as an outdoor venue for Treasure Valley theater and music productions. The key to the success of this master plan will be the development of the new lake features that will also generate $15 million in revenue by mining the gravel resources below the park to help offset the park development costs.